It's... It's cute. It's really cute. Just... watch it. It's only 5 minutes. I mean, the plot is paper thin, the characters are bland, but WHO CARES?!?! It's freaking CUTE. The way they add 3d animation to the real world is cool. It's like... Cat videos. They're veritably pointless, but BY GOD you'll watch it anyway. My 3 year old loves it! Subtitles or not my 3 year old son loves it! It's cute, silly, has a funny set of things going on and combines well to be a few minutes of something fun. In other news it is great for keeping him occupied when I need to get something done. Although I can't deny it's kind of fun to watch with him. "Daddy I want to watch Nyan-bo!" Since Bananya is over, Nyanbo! is here to replace it with its own cast of cute cat-like characters. I'd say Nyanbo! is equivalent to the 3D Pikmin shorts, except with 3D cat aliens in a live action world. The 3D animation is very well done, the characters blend in completely with the live action environment. 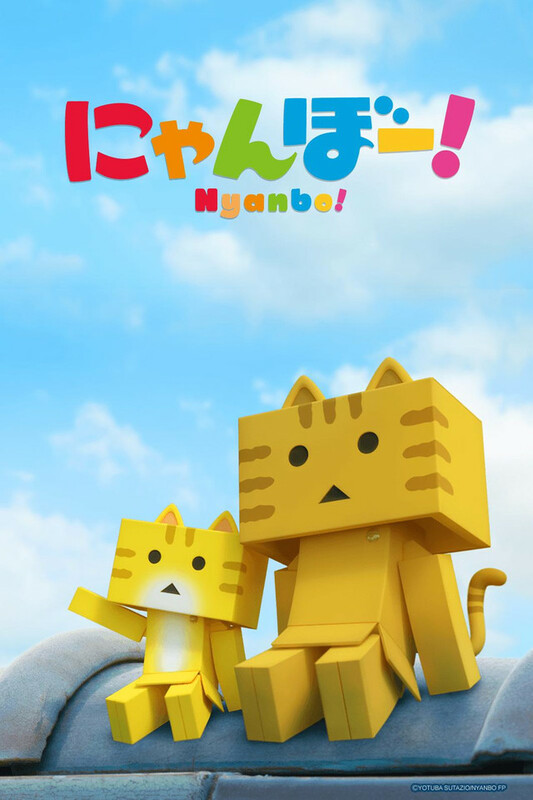 It's pretty seamless, with the exception of a few scenes, but otherwise Nyanbo! looks great. Like Bananya, there most likely won't be any sort of plot and will follow the adorable adventures of the Nyanbo. It's one of those cute and relaxing short form "anime"? I, for one, am extremely happy that Nyanbo! has filled in the empty hole in my heart that Bananya has left. If you're like me and just want to indulge yourself with some lovable cat mascots after a long day, knock yourself out. This show is cute. That's mostly it, but that's what it's going for. The episodes are short but don't feel rushed. Each little story touches on a mostly relatable issue, though not all. I loved the animation combined with real life. It's pretty seamless and it feels like they really are in the real world. The only times it seems a bit off is when they have real animals trying to react to the animated characters, but still a pretty good job of it. This is definitely a showcase of this style of filming/animation and I would definitely watch more from this studio just for that. Honestly, this would be great for small children. It's cute and colorful. The characters are fun, and playful.. but the story just didn't interest me much (And I love kid shows haha!) Though I did only watch it because I love Danbo, and figured I couldn't go wrong with a cat version. The story isn't the greatest! It's very simple with each Character being very Cliche. It's a show designed for younger ones who are learning basic everyday things, Whislt being cute and funny. With each Ep only being 5mins long, It's Relaxing and Enjoyable for all ages! Just don't expect a lot. The episodes of this show are really short (5:00 minutes each), so one could technically binge watch it all if they needed a mega-shot of "Aww!". I personally couldn't do it, just because the plot moves at an imperceptible pace. It makes a great daily pick-me-up though - nearly every episode is good for a laugh or two, and the characters are very sweet. Besides that, I thought the voice acting was really fun to hear, and the animation is...oddly smooth! The plot usually takes a backseat to character building and laughs, but it is ultimately solid. All in all, its basically a great kids' show that is polished enough to be pretty amusing for adults too.